There is a lot of controversy among professionals about whether cork is an appropriate flooring material for moist locations, such as bathrooms, kitchens, or subgrade basement installations. On one hand, it does have a number of properties which make it resistant to some of the challenges posed in these locations, but it is not as impervious to these factors as some other flooring options, and depending on the exact nature of the environment, it may not be an appropriate option for you. The problem arises later in the document, where the instructions clearly state that you need to “Maintain a healthy humidity at 40-60%.” It also advises you to never wet-mop the floor. This implies that the floor should, if possible, not get wet. Of course, in most bathrooms, the humidity is going to occasionally rise far above 60 percent, and spills and drips are bound to occur—especially in bathrooms with shower or tub fixtures. Cork may be fine in a half-bath, but questions arise if you are considering it for a bathroom with bathing fixtures. 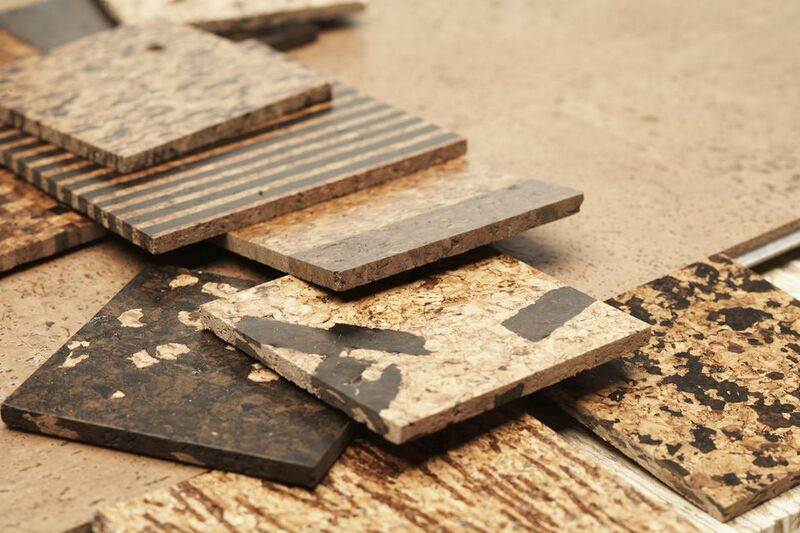 Solid cork tiles: This is the most common incarnation of cork flooring materials, with individual self-adhesive tiles that are installed directly onto the subfloor. The tiles generally have a UV treated polyurethane finish on the surface; however, in a bathroom, you still need to seal the tiles multiple times in order to make the seams water repellent. The problem with solid cork tiles is that they are very soft, and when you walk on them, the tiles will bend slightly, which can cause the seams to break apart and the sealer to crack. This can allow moisture to penetrate down into the substructure of the floor and cause the adhesive to loosen and mold to form. In addition to this, a high level of humidity in the air can cause the material to be plump and expand. This means that a steaming shower can eventually leave you with a floor full of cork pieces that have popped up. For this reason, solid cork is generally not recommended for installation in bathrooms. Click-together floating cork floors: These are tiles and planks that are constructed with a 3mm cork surface layer adhered to a fiberboard backing. The surface layer gets a UV-cured polyurethane wear layer that coats the top of the piece, making it impervious to moisture penetration. This can be combined with a vapor barrier underlayment and a coat of seam sealer to make the installation nearly impervious to water. You should only consider the highest quality floating cork materials in a bathroom, and make sure that the manufacturer approves its use in high-moisture environments. Verify that installation in this area will not void the manufacturer's warranty. In addition, make sure that the materials have a thick, durable wear layer and that you have a quality sealer to apply to the seams. You also need to seal the perimeter crevices with silicone caulk upon completing the installation. It's possible, though, that even these high-quality engineered products will still suffer from expansion issues in high humidity areas. Because of this, even top-quality floating cork floors are assured of good performance in bathrooms where spills and splashes can be avoided. The very best cork products will probably not hold up in a bathroom used by children. Excessive spills and standing water can plump, warp, and distort the flooring materials. If water penetrates the seams, it can get under the tile, causing the adhesive to come loose. Humidity will cause the tiles to expand and contract, popping them from their installation. Refinishing in small bathroom spaces is difficult due to the size of the machinery required. Cork does have a natural resistance to moisture and is a better choice than many hardwoods or carpet alternatives in this space. Individual tiles can be easily replaced if damaged, especially if you install click-together pieces. Cork naturally resists the growth of mold and mildew, although they can gain a foothold if excessive moisture is allowed to seep in. Are You Considering Hardwood Flooring for Your Bathroom? Are Cork Floor Tiles Right for Your Kitchen? Bathroom Vinyl Tile vs. Ceramic Tile: Which Is Best? Is There a Waterproof Version of Laminate Flooring?